The Fluke 1623 are distinctive earth ground testers that can perform all four types of earth ground measurement. 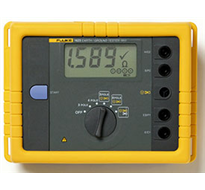 Specifically, the Fluke 1623 testers are able to measure earth ground loop resistances using only clamps – called Stakeless testing. This method doesn’t require the use of earth ground stakes or the disconnection of ground rods. Testing Methods 3- and 4-Pole Fall of Potential – standard earth ground testing using two ground stakes Selective testing – without disconnecting ground rods, a technician can measure ground resistance using a combination of stakes and a clamp. Stakeless testing – innovative solution using only clamps, instead of ground stakes, to measure earth ground loop resistance. Advanced technology for all your earth ground testing applications 1623 One-button measurement concept 3- and 4-pole earth ground measurement 2-pole resistance measurement AC Selective testing, no disconnection of ground conductor (1 clamp). Stakeless testing, quick ground loop testing (2 clamps). Measuring frequency 128 Hz.